Swansea City chairman Huw Jenkins says the possible takeover of the club would not change their managerial plans. Steve Kaplan and Jason Levien lead an American consortium which could acquire a controlling interest in the club. Head coach Francesco Guidolin has guided Swansea to Premier League safety, but his contract expires at the end of the season. "All the options are there - that has not changed from day one," Jenkins told the South Wales Evening Post. "Over the next couple of weeks we are going to sit down and discuss Francesco's thoughts. "We will discuss his views on the team and the club and on the situation going forward." 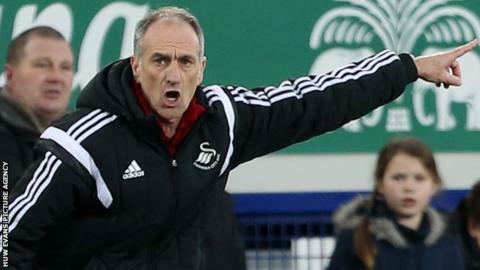 Swansea have said Guidolin's position would be reviewed at the end of the season, and the 60-year-old Italian has made it clear he would like to extend his short-term deal. But the Swans could move in a different direction, with businessmen Kaplan and Levien hoping to conclude a deal within weeks to invest in the Welsh club. Jenkins and vice-chairman Leigh Dineen will stay on at Swansea in an executive capacity if the American buy-out does goes through. Asked if the potential change of ownership would change the position regarding Guidolin, Jenkins added: "I don't think so. "Results have improved from December onwards, and we can't say anything other than we are all delighted with how things have worked out."